The roof of Zoar Lutheran Church being slowly clawed away. A piece of my childhood is vanishing before my eyes. 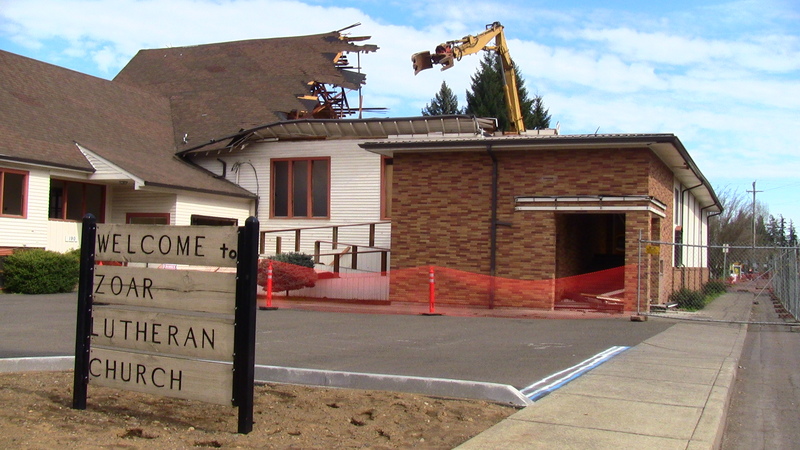 Zoar Lutheran Church, the church I grew up attending since before my memory of life began, is demolishing its old building. 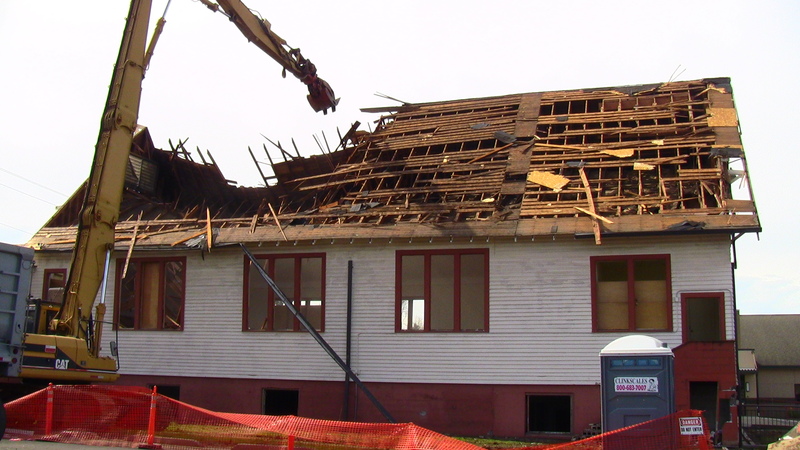 The building has stood, with many renovations and additions, since 1928, and now it’s coming down. Even as I write this, I’m watching a giant claw transfer the rubble of the sanctuary into the back of a large truck. Services moved into the new building (actually the new Fellowship Hall, but being used as the whole church until the next phase of construction) last month, and the process of gutting the old church began. My family took a few mementos (a sign and a small pew), as did many others. Yesterday, the actual demolition finally began. It was both thrilling and heartbreaking to watch the large, dragonesque machine tear down a building I thought would still be standing long after I died. The deconstruction as seen from the front of the church. So far, they’ve only taken down the sanctuary, which comprised the middle portion of the church’s first story. This happens to also be the oldest part of the building, the other wings having been added on in the 50’s and 60’s. It was strange, realizing how many memories were made in that space and being forced to acknowledge that no physical, tactile place remained to house those memories. I took for granted, all my life, that this building would always be there in some form, no matter what changes it went through. Soon, it will all be gone, the basement filled in and paved over. It’s difficult to watch it happen, but I’d rather document it as it happens than just walk by one day and have it suddenly gone.